A real fruits taste from a beautiful Austrian village. Be indulged in the taste of home. blueberries* (60%), agave juice*, lemon juice*, apple pectin as gelling agent. 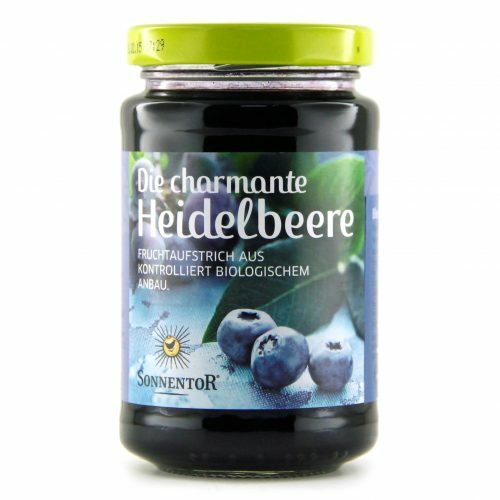 Contain 60% of organic blueberry. Sweetened by low GI agave juice, therefore help to achieve healthy blood sugar level. No synthetic preservative and artificial colouring. keep at cool dry place, refrigerate once opened. You can spread it on breads, scone, biscuit and crackers. Serve as a topping on ice cream and smoothie. Serve with your breakfast cereals, oats or muesli. Dilute 1 tablespoon of jam with 250ml water. Chill it for a refreshing fruity drink. You can add some lemon juice to enhance its taste.